Family Guy, Stern Pinball's latest creation has begun shipping. 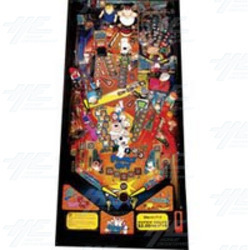 Based on the smash hit animated comedy by Seth McFarlane, the pinball features artwork of the all the classic characters. To make the pinball suitable for all ages, it offers three different adjustable levels of speech (Adult, Moderate and Family). The Family Guy pinball machine introduces a unique element to pinball - Stewie's mini-playfield. Stewie's mini-playfield is a small pinball playfield that sits in the upper right hand corner of the main playfield. It has mini-flippers that the player controls with the regular flipper buttons when the game is in 'Stewie mini-playfield' mode. The mini-playfield even has ramps and targets to shoot at while a toy of Stewie turns on its axis in front of the mini-playfield - taunting the player into believing they have no chance of beating Stewie.